A stylish stainless steel bracelet watch from the iconic Aqua racer series by TAG Heuer. Designed with a blue dial and bezel with date window at three o'clock. This is pure indulgence from TAG Heuer. 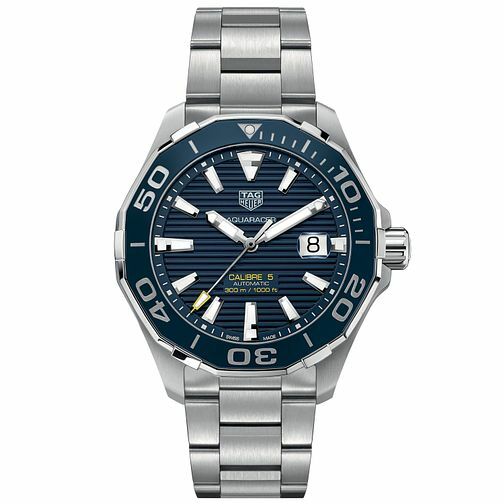 Tag Heuer Aquaracer Men's Stainless Steel Bracelet Watch is rated 5.0 out of 5 by 1. Rated 5 out of 5 by Anonymous from GREAT WATCH..ELEGANCE ON YOUR WRIST... I BOUGHT THIS TAG HEUER AQUARACER FOR MY RETIREMENT EVERYTHING ABOUT THE WATCH IS WHAT YOU WANT IN A TIMEPIECE...EVERYDAY WATCH AND LOOKS THE PART WHEN DRESSED FOR THE EVENING..